Synthetic peptide corresponding to residues in Human COL11A1 (UniProt ID: P12107). Our Abpromise guarantee covers the use of ab166606 in the following tested applications. WB 1/1000 - 1/5000. 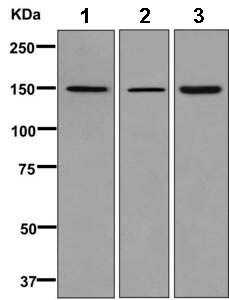 Detects a band of approximately 150 kDa (predicted molecular weight: 181 kDa). Cartilage, placenta and some tumor or virally transformed cell lines. Isoforms using exon IIA or IIB are found in the cartilage while isoforms using only exon IIB are found in the tendon. Defects in COL11A1 are the cause of Stickler syndrome type 2 (STL2) [MIM:604841]; also known as Stickler syndrome vitreous type 2. STL2 is an autosomal dominant form of Stickler syndrome, an inherited disorder that associates ocular signs with more or less complete forms of Pierre Robin sequence, bone disorders and sensorineural deafness. Ocular disorders may include juvenile cataract, myopia, strabismus, vitreoretinal or chorioretinal degeneration, retinal detachment, and chronic uveitis. Robin sequence includes an opening in the roof of the mouth (a cleft palate), a large tongue (macroglossia), and a small lower jaw (micrognathia). Bones are affected by slight platyspondylisis and large, often defective epiphyses. Juvenile joint laxity is followed by early signs of arthrosis. The degree of hearing loss varies among affected individuals and may become more severe over time. Syndrome expressivity is variable. Defects in COL11A1 are the cause of Marshall syndrome (MARSHS) [MIM:154780]. It is an autosomal dominant disorder with ocular, orofacial, auditory and skeletal manifestations. It shares several features with Stickler syndrome, such as midfacial hypoplasia, high myopia, and sensorineural-hearing deficit. Publishing research using ab166606? Please let us know so that we can cite the reference in this datasheet. There are currently no Customer reviews or Questions for ab166606.